From arid deserts to tropical forests to lush grasslands, Australia is a place of natural beauty and some of the most outstanding hunting areas in the world. There are many native and non-native species available for hunting in Australia and international visitors are always welcome to come hunt down under. Whether you prefer the thrill of the trophy hunt or just want to hone your skills on smaller game, Australia has the perfect hunting locale for your needs. The numerous habitats available in Australia make this island home to many different species of game. Hunters are welcome to try their skills on coastal plains, rocky mountainous regions, in lush forests, or on the dry desert lands. Each habitat offers the hunter a unique hunting experience that cannot be matched anywhere else in the world. Many of the species available for hunting in Australia are non-native species that were introduced to the land by colonists and were allowed to spread to the point where they are now considered a problematic species. These species have been allowed to become feral over the years and are now found wild in many areas of Australia. Some of the game that falls into this category includes goats, pigs, rabbits, foxes, water buffalo, several species of deer, and certain species of birds. Many of the individuals that enjoy hunting in Australia choose to hunt the six species of deer that are legally hunted in many different areas of the nation. One of the most popular deer to hunt is the Sambar deer, a beautiful trophy animal that is the largest of the deer in Australia and the third largest deer species in the world. Their shyness makes them one of the hardest game animals to hunt and a seasoned hunter would need to use all of their skill to bring one of these majestic animals down. Other deer species available for hunting in Australia include the Chital deer, the Hog deer, the Rusa deer, the Red deer, and the Fallow deer. There are numerous hunting guides available in many areas that are willing to show hunters were the best places to find their preferred deer would be and give any tips that may make the hunt more successful. Although the hunting seasons for different species of deer begin at different times, the most deer species are available for hunting in May through August. 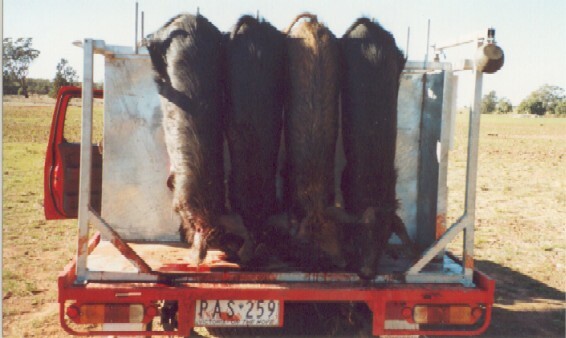 There are also large species of pigs and boars available for hunting in Australia. These animals are so destructive to the land and harmful to the environment that there is no limit to how many of the animals a hunter is allowed to take and the season lasts throughout the entire year. The best time of year for hunting pigs in Australia is from the beginning of July to the end of November, when the weather is more comfortable for the hunters. Many hunters in Australia choose to practice their skills while hunting the millions of rabbits that have invaded the land. Introduced by Spanish settlers that wanted their new homes to resemble their old land, rabbits have become the most destructive non-native species to be introduced to Australia, causing billions of dollars in damage each year. It has been estimated that hunters would need to take more than 150 million rabbits each year to produce even a small dent in the rabbit population of Australia, currently estimated at more than 600 million. Because Australia possesses such vast wilderness and many hunting areas are far from human habitation, there is no hunting limit on many of the feral species of animals found on the land. International visitors may want to acquire a hunting guide to show them where they are allowed to hunt and where to find their preferred game, but many local hunters make their own arrangements with individual landowners, who are often all to happy to have a hunter remove pest animals from their land. A hunting permit is required for all individuals that are engaging in hunting activities and any individual under the age of 18 must be supervised by an adult. Many of the hunters that go hunting in Australia use a firearm for their hunting adventures. Although rifles are vastly more popular, some individuals choose to hunt with shotguns or other firearms instead. It is important to review the game laws for whatever type of game is chosen to be the quarry as it is illegal to shoot some types of game with a lower caliber bullet, a law intended to limit the suffering of the animal. Bow hunting and trapping are also allowed when hunting in Australia. Arrows used for hunting larger game must be broadhead with at least two sharpened edges and the bows must conform to certain specifications. Dogs and ferrets are also sometimes used when hunting smaller game in certain types of terrain, flushing the game out of their hiding places and into the path of the hunter. Hunting in Australia can be a great adventure for hunters at all levels of expertise. Whether hunting the numerous rabbits to perfect your skills or trying your luck with the larger, trophy game animals, there is a hunting experience that is right for you. All you need is a license, the right equipment, and a love of the outdoors. Send your pics and stories to mail@ozziehunting.com - we'll actually pay you $20 for any story (over 500 words) that we publish! © 2019 ozziehunting.com - All rights reserved.